Reaping benefits: Sales of Indian cotton are expected to go up. New Delhi: India’s cotton trade will enjoy a windfall in the new season as the country’s exporters anticipate a longer queue of overseas buyers because of supply shortfalls in other leading producing nations. With the US expecting a fall in cotton sowings, traders said India would see increased sales of cotton to China and South-East Asian nations in the year ending September 2008. And this would help Indian exporters sell its expected record output in the new season at prices about 10% higher than last year. 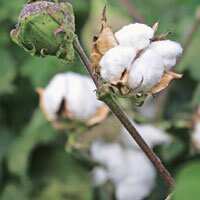 “Indian cotton will benefit from high prices," said Avinash Raheja, an analyst with Commtrendz Research. Cotton hit highs near $1.20 (Rs47.64) per lb in the mid-1990s and some analysts said prices could touch $1 in this bull run as market players expect it to be the next commodity to catch fire. On Tuesday, the open-outcry December cotton contract in New York slipped 0.15 cent to settle at 66.08 cents per lb, trading between 65.15 and 66.43 cents. “First we had a rally in corn, now it’s in soybeans and wheat, and possibly cotton would become the next hot commodity," Raheja said. Analysts said cotton would also also find support as prices of polyster were high because of surging crude oil prices. Cotton in domestic Indian markets is quoted at 21,000 rupees per candy, or 356 kg, up 7% from the same time last year, traders said. In the new crop season starting in October, India’s cotton output is forecast to hit a record 31 million bales, up almost 11% from 28 million bales in the current season, said Kishorilal Jhunjhunwala, president of the East India Cotton Association. But domestic consumption in the new season is to grow only 1.5 million bales, from this year’s 23.5 million bales, according to the state-run Cotton Corporation of India. This would allow the country to sell more overseas. Traders said India’s cotton exports would grow nearly 20% next season, from 5.5 million bales, with higher use of cotton by mills in Asia. But an 11% rise in the value of the rupee against the dollar this year would slice profits. Analysts said China’s cotton import needs in 2008 would grow to 3.5 million tonnes (mt) from 3.2 mt. This would give India an opportunity to meet the additional demand given a smaller US crop and relatively lower freight from the South Asian nation. In addition to supplying to China, India sells cotton to Indonesia, Thailand, Bangladesh and Pakistan. Global cotton output is forecast to drop to 25.4 mt from 26 mt a year earlier, the International Cotton Advisory Committee said this month. World consumption of 27 mt will outstrip supply by 1.6 mt and 75% of the demand, or a record 20.3 mt, will come from Asian cotton mills, it said. “Our cotton prices will remain high irrespective of a record domestic crop," said Prerna Desai, an analyst with Man Financial. India achieved a jump in cotton yields following approval for commercial cultivation of cotton hybrids in 2002.